Abelia x grandiflora Nana or Dwarf Abelia is a compact, low-growing shrub with arching branches and bronze/red new leaves that age to glossy green. The white bell-shaped flowers are fragrant and pretty, covering the plant from spring through to autumn. They grow just about anywhere, and are great for those difficult spots in the garden. 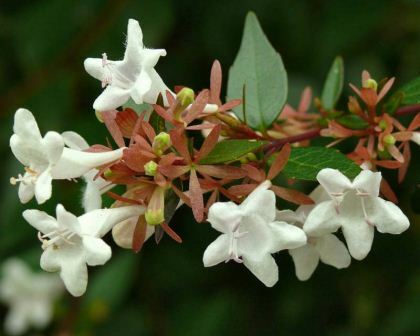 Abelia has the tendency to become straggly, but benefits from regular trimming. If you're prepared to keep it trimmed then it makes a very good feature and will reward you with flowers for many months of the year. "Nana" is a more compact form that generally does not get as straggly, but will still benefit from regular trimming. Maintenance: Dig hole double the size of the pot and backfill with friable soil or compost. Water in well then twice week for first month until established. Benefits from robust pruning at least once a year. Water well in summer. Diseases: #1. Susceptible to black spot in humid conditions - spray will Bayleton or parrafin and soapy water. #2. Also attractive to blackfly - plant garlic around the base or spray with a pyrethrum based insecticide. yvonne - northan hemisphere: when will my Abelia bloom. Webmaster - Sydney: Well, Yvonne, as the 'Flowering time' indicates for southern hemisphere that they will bloom for all spring and summer, through to autumn in the southern hemisphere, so you can assume it will be the same for you in the north. 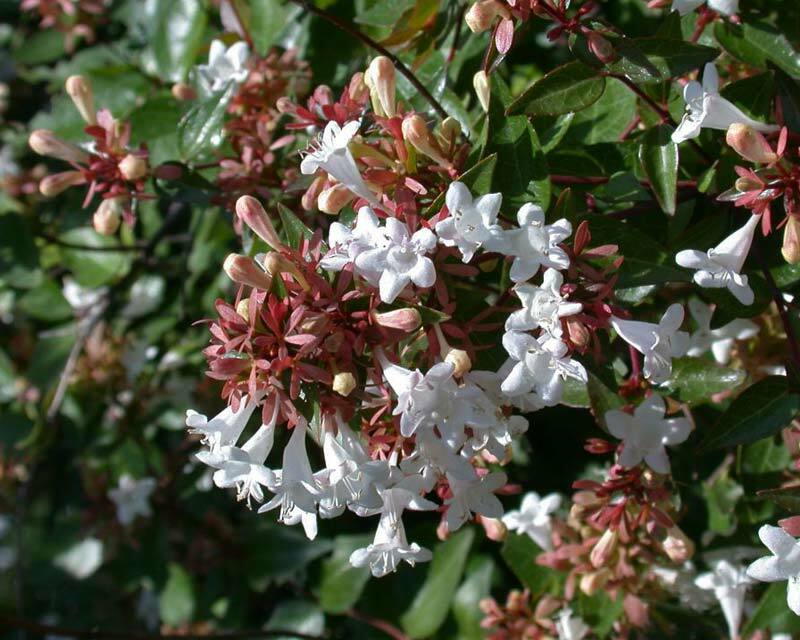 Look out for blooms from April through to October..
yvonne moram - sandhurst berkshire u k: When is a good time to trim my small leaved Abelia? PS when will it bloom?. Webmaster - Sydney: It will flower from spring through to autumn, Yvonne, and you can prune it after flowering has finished in late autumn to winter. They don't have to be hard pruned every year, but they will benefit from a decent trim back to ensure they don't get too straggly..